First job was to recover the vehicle security code, which will allow me to check for and apply factory firmware updates as well as enable the various convenience features. The setup I use for this is a GQ-3X from MCUMALL in Canada. It’s a really well featured device programmer and coupled with a SOIC test clip, I can read the EEPROM in the audio head unit, which (assuming it has never been changed) holds the same security code that the rest of the car uses. Great, that is now sorted and I will use Tech2 to recover the mechanical key number from the car so I can record that as well. Given the car came with both keys I rather hope never to need it. 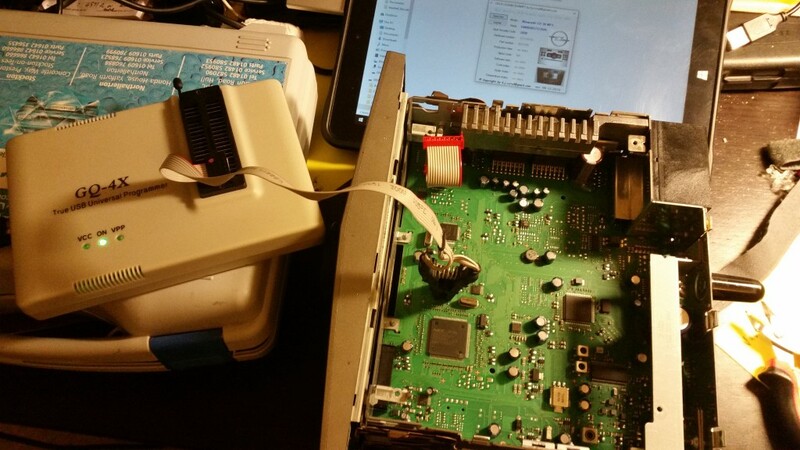 I can recover the security code from the display (BID, GID or CID) or the entertainment head unit (CD30, CDC40, CD70) and have a test loom so I can connect and programme / divorce these components as well as DAB and UHP modules in my workshop, without the car present.